In some cases, the resistor may have to be less than 1Meg, but try not to go below 200K. Also keep in mind that this resistor also controls the sensitivity of the circuit to light. The 5K resistor is used to adjust the brightness of the VR tube by reducing the 120V mains supply. 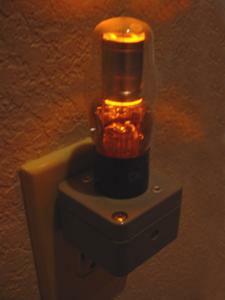 Less than 5K will brighten the tube but shorten its life, and greater than 5K will make the tube dimmer. Please note that adjusting the 5K resistor might affect the sensitivity so the bias resistor may need readjusting if the 5K resistor is adjusted. The 0C3 (VR105) will work instead of the 0A3 (VR75) but gives off a weak purple glow. The 5K resistor can be decreased to increase brightness. Also, while there is not a specific "type" of CDS cell that works best, the largest CDS cell from Radio Shack's CDS assortment works nicely along with a 1Meg bias resistor. 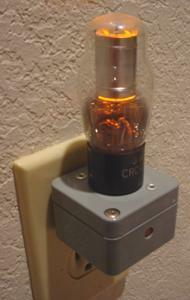 The 0A3 tube is active in both photos, the only difference is the camera's exposure settings. The nightlight will shut off completely in broad daylight.